A little over a year ago, I moved into a new home. 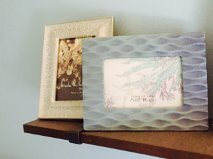 Almost every room in my house is now decorated with mementos or items that speak to who I am as a person, mom and friend. Yet, I have about six picture frames throughout my home, currently being displayed, that are empty. Up until a few days ago, I felt the need to fill them with pictures (even if they wouldn’t sustain longevity). All of a sudden my mindset shifted. Instead of seeing them as empty, I started seeing them as opportunities. I started dreaming of what would (one day) be placed inside the frame and the empty frame became a symbol of hope. New beginnings are just that. Be it a blank canvas, white walls or an empty classroom in August. New beginnings allow one to create vision, explore new ventures and dream of the future. As I sit here, my final weekend before school starts, I understand that my class’s story is about to unfold. For many of my students, who have had trauma, heartbreak or fear school, this upcoming week is a new beginning. This new beginning is an opportunity to build trust, hope and engagement. For me, it is a time to renew my love of teaching. To vow to omit the negative lunchroom conversations (does anyone else have those?) and focus on enjoyment of my job. And so… ready or not… Tuesday is our new beginning. As a team, we will shape our journey together. I will be humbled, more often than I even want. I will be frustrated at myself for not knowing what to do next. And I will persevere with a driving force to give my students every opportunity to succeed. I wonder what the empty picture frame will hold come June! I also can’t wait to see what fills the frame come June!